Dimensions 1.25 by 6.25 by 9 in. In this groundbreaking health and lifestyle guide, the superfoods expert, nutritionist, and creator of Shakeology provides the key to understanding and utilizing the five life forcesâtheÂ sole factors that determine whether or not we will be healthy, fit, and free of illness. InÂ Superlife, Darin Olien provides us with an entirely new way of thinking about health and wellbeing by identifyingÂ what he calls the life forces:Â Quality Nutrition, Hydration, Detoxification, Oxygenation, and Alkalization. OlienÂ demonstrates in great detail how to maintain these processes, therebyÂ allowing our bodies to do the rest. HeÂ tells us how we can maintain healthy weight, prevent even the most serious of diseases, and feel great. He explains that all of this is possible without any of the restrictive or gimmickyÂ diet plans that never work in the long term. 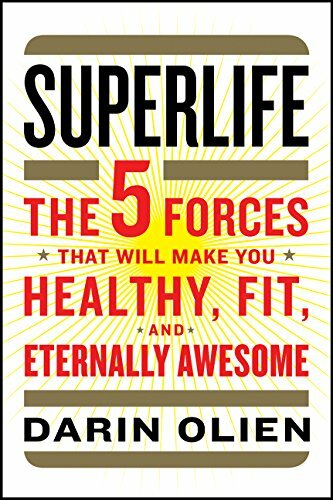 Written in Olienâs engaging conversational style,Â SuperlifeÂ is a one-of-a-kind comprehensive look at dieting and nutrition, a timeless and essential guide to maintaining the human body and maximizing its potential. About: In this groundbreaking health and lifestyle guide, the superfoods expert, nutritionist, and creator of Shakeology provides the key to understanding and utilizing the five life forces—the sole factors that determine whether or not we will be healthy, fit, and free of illness.